In the hustle and bustle of your normal work week, it's easy to pass over the marketing items that are on your to-do list. Then that mid-week slump hits. Now all of a sudden those marketing to-do’s that you didn't have time for are back at the front of your list. Are you attracting the right kind of customers? And if so, how do you get them to come back in more frequently and bring their friends and family? To help, we have compiled some of our top attention-grabbing tips into one list to help you get started strong in 2019. This year, there are a few things you’ll need to do as a restaurant owner. You need to promote your business. You need to show customers who great your food is. You need to encourage repeat business and word-of-mouth referrals. Keep reading to learn exactly how to accomplish these fantastic feats. Repeat customers are the lifeblood of most restaurants. According to the National Restaurant Association, up to 80% of a restaurant’s sales come from repeat customers. If you want to increase repeat customers, there are a few high-value loyalty strategies worth investing in. Moreover, according to a customer loyalty study conducted by Bond Brand Loyalty and VISA, 57% of respondents said that they prefer mobile-based loyalty programs. Thank You Messages. Automated thank you messages can be sent to customers after they purchase products. This helps them feel appreciated and valued and begins building that long-term relationship. Special Offers. Customers that are in your loyalty program can receive special offers on a regular basis. This is a fantastic way of encouraging loyalty program sign-ups as well as incentivizing repeat business. Notifications of In-Store Specials. You can send a text message that notifies your subscribers of in-store specials. For example, if you're going to have live music or if you have a daily soup special you can share that out. User-generated content is defined as anything on the web that users have a hand in creating. Most of the photos, videos, and other posts that you see on the web and social media channels are user-generated content. Essentially it's anything that you don't have to create yourself, but that you can leverage as part of your marketing strategy. It can work to engage your customers and start building a community around your brand. 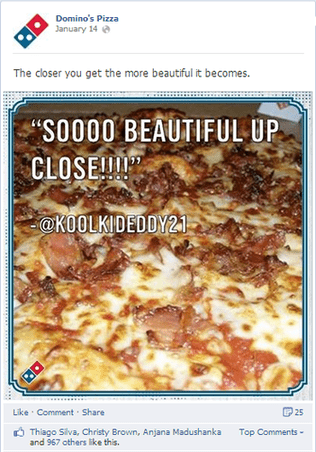 For example, Domino's used this tweet that was posted by a fan and pasted it over an image to create a visual piece of user-generated content that they could share on Facebook and other networks. 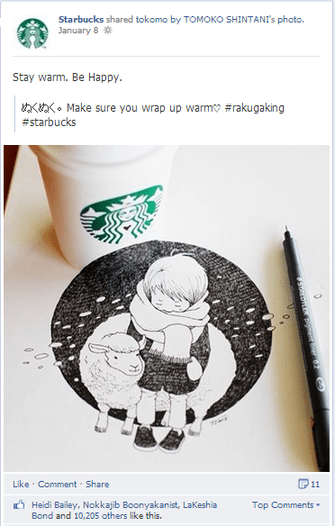 From contests encouraging people to decorate their cups to simply sharing posts from users, Starbucks is another restaurant that does really well with UGC. You could start your own UGC campaign by simply hosting a photo contest. Simply ask customers to share their favorite meal at your establishment with a quick photo. You can then share those entries on a dedicated page on your website, or you can share them out on social media. SMS boast nearly a 100% open rate within the first three minutes. This makes it a great way to increase immediate sales. For example, if lunch on Tuesdays is particularly slow, you can boost sales by sending out a quick text message with a coupon for a free dessert with a purchase of a meal. Using text message marketing is a pretty simple process. You come up with an offer, and then you get customers to subscribe. After they subscribe, they get a reply welcoming them into the program that includes a coupon. Customers are able to use that coupon right then while they're in the restaurant. From there, you're able to send out weekly specials via text message to your growing list of subscribers. This brings customers back to enjoy the deals on your food. You do not need any advanced technical or design skills to make text message marketing successful for you. If you use a texting platform like EZ Texting, it can help make text message marketing for restaurants even more efficient and effective. You can include links to website pages. Messages can be saved as templates to make it faster to reuse them. Subscribers can be segmented into relevant groups. Your messages can be personalized to include their name. Images and videos can be sent to show off your food or other noteworthy moments in your restaurant. Maybe you have a franchise location of a large chain restaurant, or maybe you've built a mom and pop restaurant using your family's tried-and-true recipes. Either way, it's important for you to build a reputation in your local community. You need to give local customers and visitors a reason to choose you over the other restaurants in the area. Maybe there's a large concert series going on in downtown. You could offer a discount on lunch if people show their ticket stub. During a local election, you could offer a discount if people show a photo of themselves outside the polling station. Not only are you participating in your community, but you are also creating an offer that is highly shareable. Event organizers and participants will want to tell others about the offer that you are providing. This kind of marketing tactic is a smart strategy when you want to make a big local splash. As a restaurant owner, sharing recipes on social media might feel a bit intimidating. As a restaurant, it can be intimidating to consider sharing posts on social media that include recipes. You've put a lot of thought and effort into the meals that you prepare for your customers, and you don't want to let your recipes out. You do not have to share your family’s secret recipes or divulge your special ingredients. A good recipe post could be something as basic as a standard sausage gravy or as elaborate as a chocolate souffle. People love sharing these recipes with their friends and family. The shareability of recipe posts makes it a great strategy when you want to grab attention across your different platforms. You could even create a recipe just for this promotion and feature it in your restaurant. “Try it here, then make it at home” could be a regular special that you run. Share it with your SMS subscribers, so they get notified when a new “Make it” challenge debuts. Encourage them to post photos with a special hashtag on Instagram that shows them either eating it in your restaurant or creating it at home. Compared to other marketing channels, text message marketing has proven itself time and again to have significantly higher open and engagement rates. You may have seen SMS campaigns from other restaurants that offered things like discount offers and coupons — but that’s just the tip of the iceberg. If you want to maximize your effectiveness and drive better results for your restaurant, then you need more of a strategy. At EZ Texting, we have had success in helping many different restaurants launch text messaging campaigns that delivered game-changing results. We have combined some of our best tips and tried-and-true tactics into a powerhouse playbook just for you. Download your copy today and get started creating marketing strategies that will help you boost your results.